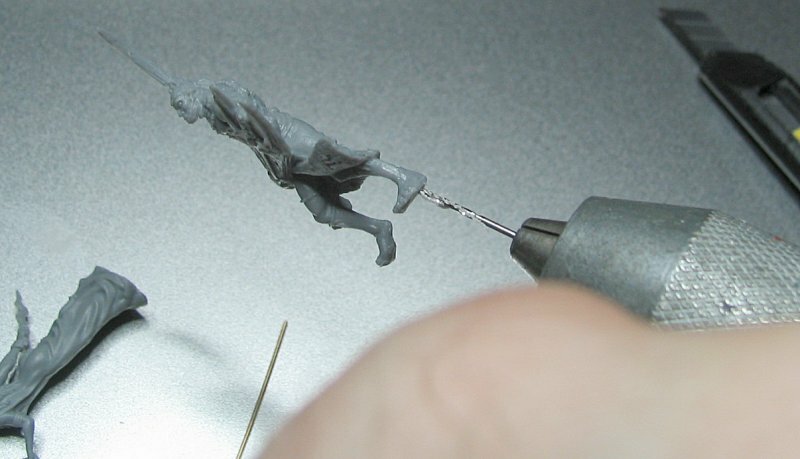 I was recently asked how I rebase miniatures, so I figured a little step-by-step of the process would be helpful to some. 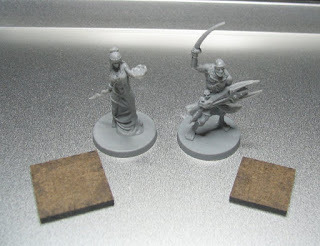 Starting off with some plastic minis from Monolith Games' board games, I want to use both of these in WarGods. The basing convention for the WarGods system is mainly squares. The female mini will act as a Demigodess so she gets a 25mm square and the guy will be a Nile Pirate (just a regular sort of guy) so he'll go onto a 20mm square. 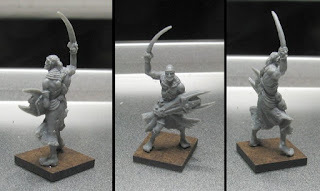 First off, the round bases need to go. For the female, I chopped away at teh round base with flush cutters. This left just a bit to be trimmed up with a hobby blade. For the guy, since his feet were the conection points, it was easier to gently slice under the feet to get him separated from the base. 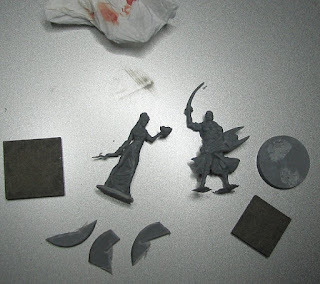 again, a little clean up around the feet will be necessary. Also, BE SURE TO CUT AWAY FROM YOUR FINGERS AND USE A SHARP FRESH HOBBY BLADE or you'll probably slice into your thumb and bleed like a stream of bad words...Below is the result of the clean up. Above are the areas on the bottom of both miniatures where I'll drill a hole to insert a bit of beading pin to attach the figure securely to the base. Below we have the drilling action into the guy's foot. When drilling into a foot like this you need to be certain of what direction your drill bit is going. If you're not careful you an come out through the side of the leg and then there's a whole repair job to be done. Slow and steady is best for this part of the process. Above, the pin is inserted into the foot hole and you can see the corresponding hole in the base. 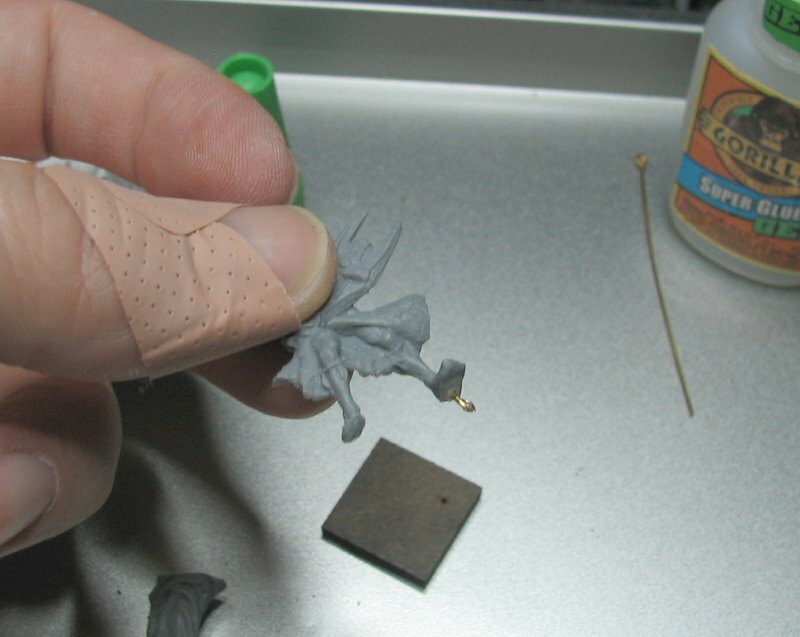 Below is a bit of glue on the pin (some on the inside hole of the leg to keep it in place. 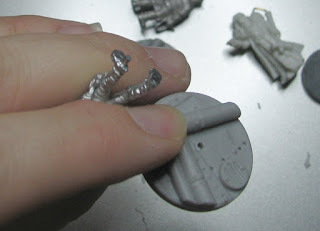 You need to be re that the pin isn't too long to stick out the bottom of the base because that means the miniature won't sit flat ont he playing surface. drop of glue on the other foot before placing onto the base and this guy should be secure from all but the most horrible of accidents. 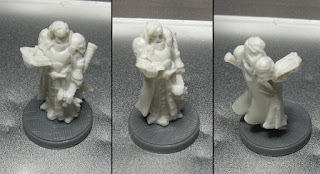 Ready for priming and painting now. 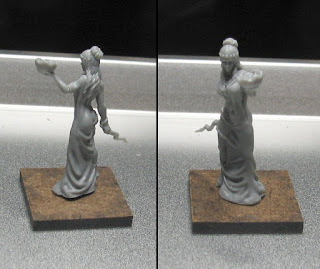 The same process for the female, she had a large point of contact to the original base, so the drilling is much less delicate, though you still want to go as straight up into the mini as possible so she'll sit flat on the base. Below she is sitting on the pin in the base- unglued because I might be modifying her a little more, so it will be easier to wrok with if she's not glued to the base yet. 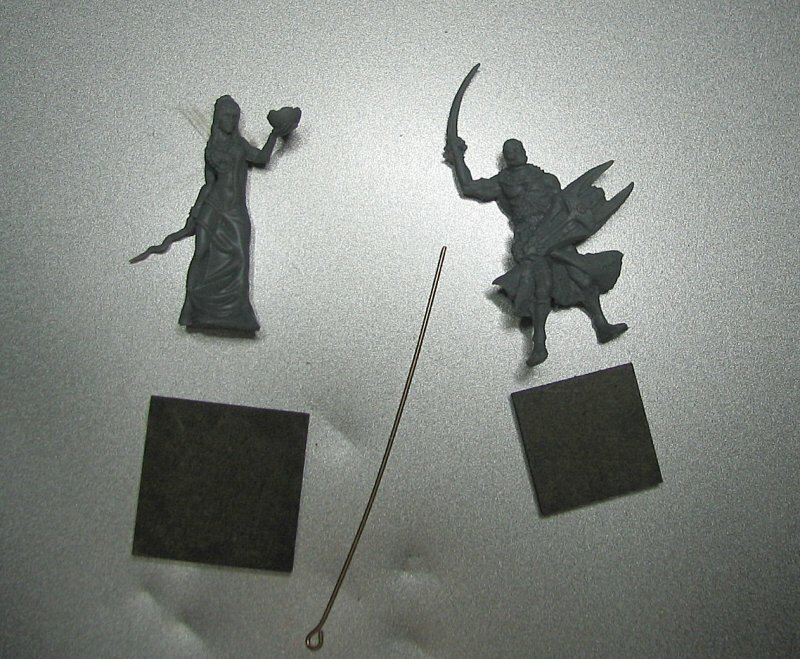 Now let's look at some metal minis with tabs and a Reaper Bones miniature (much softer plastic than the 2 above). 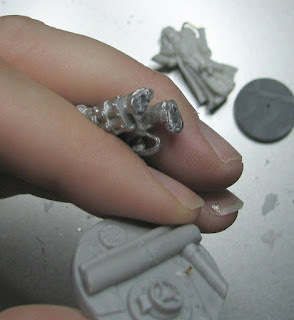 For the meatl minis with tabs, I prefer to snip the tabs off leaving a little 'peg' under one foot that I usually have to trim down more so it will fit nicely into a hole drilled into the base. The first mini below shows this peg method. The next one had too much of an awkward connection to the tab to use the peg method, so I simply removed the tab and will pin through the foot into the base. For the bones figure, it's usually a simple matter to CAREFULLY slice the base off and clean up any areas that need it before drilling to pin. 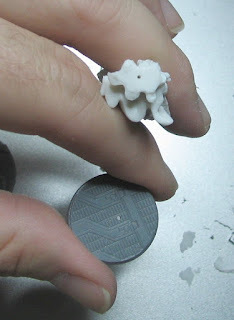 Roughly the center of the Bones mini is where I drilled into it. 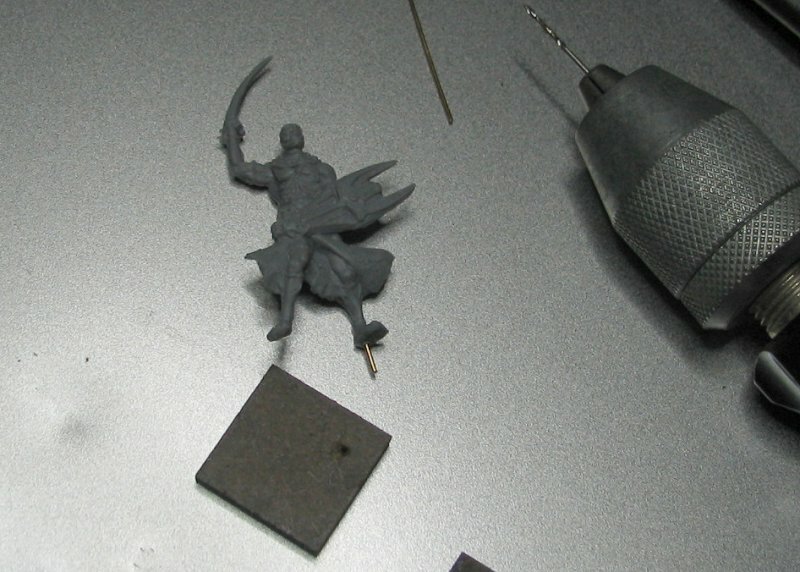 After deciding ont he base where his placement would be most dramatic, I drilled into the base as well. 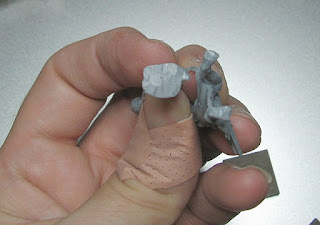 Here's the metal mini that will be pinned through the foot. You can see the pin in the base already. Finally, the metal mini using the peg method. I drilled a regular hole into the base and made it bigger with a needle file until the peg fit snugly. 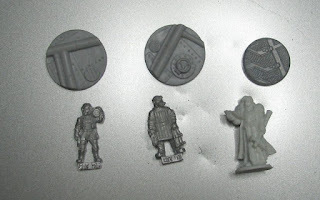 Above is the Colony 87 metal mini using the pin method. 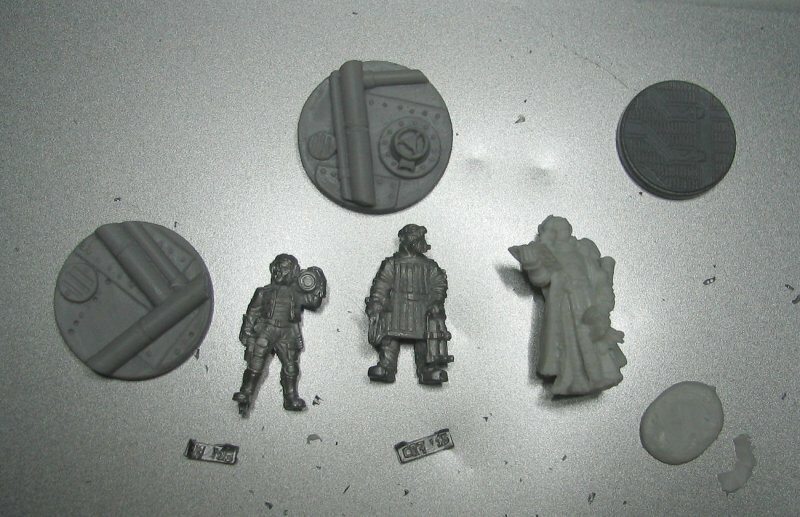 This one is the Colony 87 metal mini using the peg method. I'm a big fan of the peg method, and I use it whenever I can as I find it's easier to file down a peg than to drill and pin. Of course, some miniatures don't have the tab necessary. 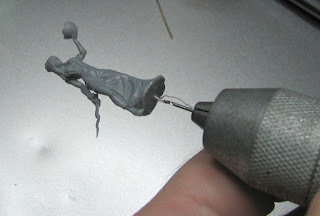 When I'm forced to pin, I dip the pin into a small drop of paint and use it to mark the position on the base prior to drilling.